Next Tuesday morning (August 28th) we’ll get to see the second total lunar eclipse of this year. Early in the morning the moon will begin its passage into the shadow of the earth. Once a month (actually every 29 ½ days) the sun, earth, and moon line up to bathe our planet in the maximum amount of moonlight, allowing moon-watchers to view all the ridges and craters on the near side of the lunar surface. But it’s only several times a year when the alignment is correct for the moon to actually enter the shadow cast by our planet. During partial eclipses it looks as though a bite has been taken out of the moon, and that’s the way it will start on Tuesday morning. However, since this will be a total eclipse, the entire moon will pass into the shadow region, and for an hour and thirty-one minutes the sun’s light will be blocked by the earth. But the moon doesn’t actually disappear. Even without direct light the moon will still be visible. As the sun’s rays pass through the earth’s atmosphere, they are slightly refracted (bent), and depending upon the amount of cloud cover and dust in the air, these curving rays will tint the moon in some shade of copper or red. The color is caused by the same phenomenon that gives us beautiful sunrises and sunsets. But this time the color is picked up overhead by the darkened moon. An eclipse is one of the best times to study the moon. As the shadow of the earth rushes over the lunar surface, it will help highlight the various moon features. A pair of binoculars will make your view even better, and if you do a bit of preparation you’ll know where to look and what to expect. 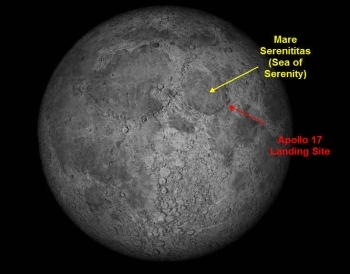 You can print out a moon map from Space.com. Just point your computer to http://www.space.com/images/skywatchers_moon_map.gif and send the image to your printer. There is also a beautiful detailed topographic map of the moon, showing the seas, craters, and mountains at http://cseligman.com/text/moons/moonnear.htm. The best show will be on the west coast, starting at 1:51 a.m. Pacific Daylight Time, with the total eclipse starting about an hour later. Add an hour for each time zone as you move east. Unfortunately on the east coast the sun will rise about half-way through the performance. The entire display will last a little over three and a half hours. The moon image (with added labels) was taken from the Distant Suns computer program. Distant Suns has both a free and a commercial software program that will display the night sky right on your computer. It’s what I use to help me explore the heavens. Check out their website at http://www.distantsuns.com/.